Orford is a village on the east coast of Tasmania, Australia 73 kilometres north-east of Hobart. Orford is known for wineries and beaches. Your plan includes some of its best attractions: kick back and relax at Raspins Beach, do a tasting at Darlington Vineyard, and take some stellar pictures from Three Thumbs Lookout. To find out how to plan a trip to Orford, use our trip itinerary maker. Tampa, USA to Orford is an approximately 30-hour flight. The time zone difference moving from Eastern Standard Time (EST) to Australian Eastern Standard Time (Tasmania) (AEST) is 15 hours. Expect colder temperatures when traveling from Tampa in August; daily highs in Orford reach 56°F and lows reach 39°F. On the 25th (Sun), you'll travel to Coles Bay. Visiting Dolphin & Whale Watching and Wineglass Bay Lookout will get you outdoors. Explore the numerous day-trip ideas around Coles Bay: Swansea (Melshell Oysters, East Coast Heritage Museum, & more) and East Coast Natureworld (in Bicheno). Spend the 27th (Tue) exploring nature at Freycinet National Park. The adventure continues: get interesting insight from Tours, don't miss a visit to Bicheno Blowhole, tour the pleasant surroundings at Hazards Beach, and get great views at Whalers Lookout. For reviews, maps, where to stay, and tourist information, go to the Coles Bay trip itinerary builder . Traveling by car from Orford to Coles Bay takes 1.5 hours. You'll set off for St Marys on the 9th (Mon). 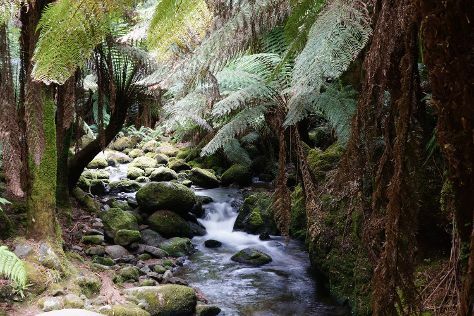 Visiting St Columba Waterfall and Douglas-Apsley National Park will get you outdoors. You'll find plenty of places to visit near St Marys: St Helens (The Shop in the Bush, Fishing Charters & Tours, & more), Pyengana (Pyengana Dairy & Holy Cow Cafe & St Columba Falls Reserve) and Denison Beach (in Bicheno). For other places to visit, ratings, more things to do, and other tourist information, go to the St Marys trip itinerary maker tool . You can drive from Coles Bay to St Marys in 1.5 hours. In September, plan for daily highs up to 59°F, and evening lows to 39°F. You'll set off for home on the 24th (Tue).